This image from the right Mast Camera (Mastcam) of NASA's Mars rover Curiosity shows a scoop full of sand and dust lifted by the rover's first use of the scoop on its robotic arm. In the foreground, near the bottom of the image, a bright object is visible on the ground. The object might be a piece of rover hardware. This image was taken during the mission's 61st Martian day, or sol (Oct. 7, 2012). NASA's Mars rover Curiosity scooped up its first sample of the Martian surface this week, only to hit a snag when the robot spotted an odd, bright object on the ground, mission managers say. 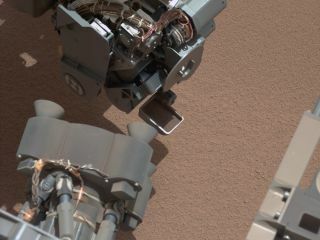 Curiosity scooped its first Mars sample using its robotic arm Sunday (Oct. 7) and used onboard cameras to snap photos of the event. It was in those images that rover team members spotted the unexpectedly bright object, which could be a sliver of Curiosity, itself. "Subsequently, the rover team decided to refrain from using the rover's robotic arm on Oct. 8 due to the detection of a bright object on the ground that might be a piece from the rover," NASA officials said in an update. Meanwhile, "Curiosity is acquiring additional imaging of the object to aid the team in identifying the object and assessing possible impact, if any, to sampling activities," they added. Curiosity's Mars sample-scooping system is located at the end of its 7-foot (2.1-meter) robotic arm and is designed to carry the samples into two instruments on the rover's main body. The instruments, called the Sample Analysis at Mars (SAM) and Chemistry and Mineralogy (CheMin), are two of the rover's core science tools to determine if Mars could ever have supported microbial life. The first Mars sample tests by Curiosity are meant to prepare the SAM and CheMin instruments for actual science measurements to be performed later. The first scoops of material will help clean the instruments of any "Earth residue" left over from the rover's assembly, ensuring that actual science measurements record only the attributes of the Mars samples, mission scientists have said. The $2.5 billion Mars rover Curiosity landed on the Red Planet on Aug. 5 and is expected to spend two years exploring its Gale Crater landing site. The 1-ton rover is the size of a small car, making it the largest rover ever to explore another world.